2018 Raffle Quilt – I hope you had the chance to see our beautiful 2018 raffle Quilt Which Way Up? coordinated by Donna Chambers, quilted by Mary Cannizzaro, and displayed at the September Guild Meeting. If not, see it here! This eye catching Log Cabin Quilt has a beautiful center medallion of machine appliquéd flowers by Kaffe Fassett arranged on a blue metallic fabric by Paula Nadelstem. The log cabin blocks are made of colorful shades of yellows, pinks , blues and greens. The quilt measures 95×95. Raffle Tickets will be available at the November Guild Meeting. Please pick up your Raffle Ticket Packet and support this year’s nominated charity The Emergency Shelter Partnership. Pillow Cases – Thanks to the initiative of Susan Deshensky, the work of Yvonne Clayton and the generosity of our membership 150 pillow cases have been shipped to Texas. Jack’s Chain –Thank you for being so prompt in returning your blocks. 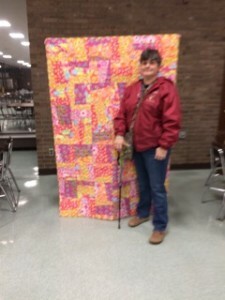 Mary Cannizzaro will be at the November Guild Meeting to collect the remaining blocks for Jack’s Chain, our 2019 raffle quilt. Comfort Quilt Fabric Request – Quilting Cotton Strips – 2 1/2″ x WOF (width of fabric, 41-45″). Give to Karen or Carol or any CQ’er. 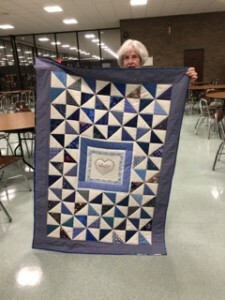 CQ Winner’s Choice Raffle – $285 raised – two quilts won – thank you all!